In 2015 the Spanische Hofreitschule zu Wien celebrates its 450th anniversary, based upon a document from 1565 about a budget of 100 guilders to build a riding arena next to the Hofburg Palace. The Spanish Riding School also commemorates the Spanish origin of the horses imported under Emperor Charles VI, with gala performances together with the Real Escuela Andaluza del Arte Ecuestre from Jerez. Here is one of these Spanish imports, the black stallion Gitano. This horse was purchased in 1718 by the Master of the Horse, Count von Althan, and brought to the royal stud in Kladrub. This information was written on the back of the painting, made around 1721 (acknowledgment to Dr. M. Döberl). Count von Althan gave many commissions for horse portraits to Johann Georg Hamilton. This one was also signed by J.Ch. Brandt, who may have painted the background. Gitano performs the courbette, a little jump or two from the levade or pesade position. The manes have been carefully braided and decorated with a rosette in the color of the saddle and bridle. This was the customary style of decoration for imperial horses. 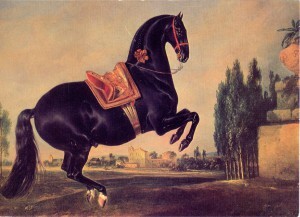 The deep black color of this horse is striking, especially in combination with two equal white markings on the hind legs. The imported Spanish horses had all different colors, certainly not only grey, as today the Lipizzans have. The single dark bay in the shows of today is a reminiscence of the previous color variations.